Love That Shots theme today is Bokeh. One of my favorite things about my 50mm lens is the great out of focus bokeh it gives! 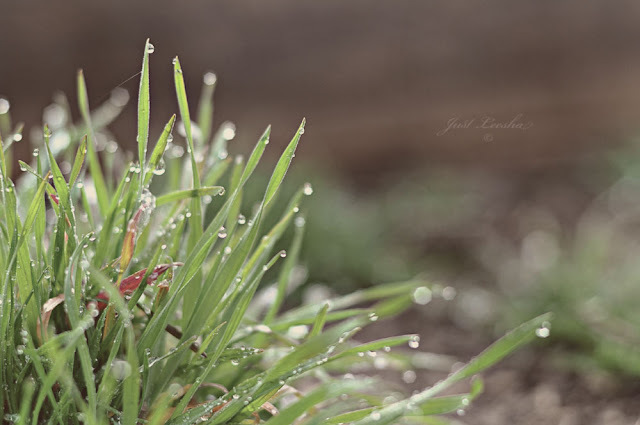 Since most of my last few posts have been lots of flowers (which give great bokeh), I thought I would drift just a tad and submit my dewy grass photo instead. There’s something sleepy and peaceful about dewy grass. You know it’s only like that early in the morning before the sun and our daily activities send all the dew packing until the next day. Awesome shot, Leesha! Great shot. I LOVE the smell of wet grass…this definitely takes me there.